News releases are distributed by the Office for Public Affairs, Wellesley's communications and media relations office. "...there is still a place for institutions like Wellesley in our world, where a woman’s ability, capacity, leadership and intellect are unquestioned..."
"...Linking our own lives and fates with those we can’t see will, I believe, be the key to a decent shared future..."
"...As graduates of Wellesley you will in time become leaders across a wide swath of pursuits..."
Global public health activist Ophelia Dahl will address the members of the 544 members of the Class of 2006 and their families and friends at Wellesley College’s 128th Commencement Exercises on Thursday, June 1, at 10:30 a.m. on Severance Green on the Wellesley, Mass., campus. Sample press release for personal use in local papers. List of area lodging, including special Commencement accommodations. Information about ASL interpreters, wheelchair rental, and campus accessibility from the Director of Disability Services, Jim Wice. 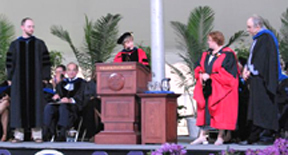 Historical look at Commencement Activities. Speeches, photos, and information about past commencement exercises.